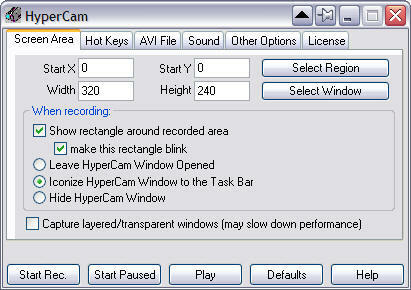 HyperCam captures the action and sound from any part of Windows desktop and saves it to standard AVI movie files. Use in preparation of software tutorials, presentations, demonstrations etc. HyperCam captures the action and sound from any part of Windows desktop and saves it to standard AVI movie files. Captures cursor movements, menus selections, windows popping up and everything else you see on the screen. Correctly handles color palette changes if recording in 256 color mode. Allows you to pan the recorded area around the screen. Optionally annotates recorded movies with text. Can be also controlled remotely by Automation client software. Use in preparation of software tutorials, presentations, demonstrations etc. Release Notes: Fix for screen area selection under screen magnification 150% or more. You can be the first to write a review of HyperCam!